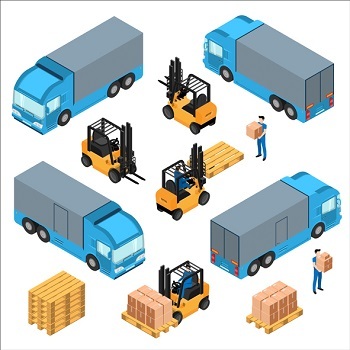 Every week we receive several questions from our clients about pallets, and loading trucks and tractor trailers with freight secured to pallets or skids. 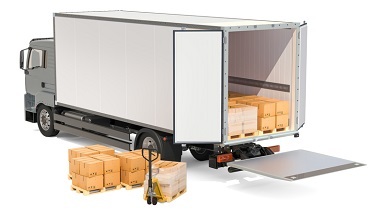 For example, our clients often ask us how many standard pallets can fit in a truck, container, or trailer? And what are the dimensions of a standard pallet? Here are the answers, and all you ever need to know about the subject. So, let us begin! 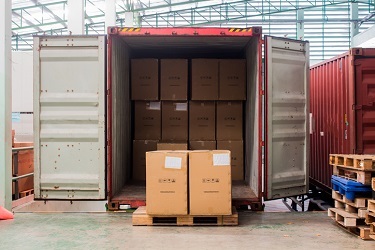 We call it Full Truck Load or FTL, and it depends on a few factors: (inner) measurements of the truck, the size of the skids/pallets themselves, and the weight of the shipment. The inner measurements of a truck (relevant to the USA based trucking industry) vary according to the type of “Van”. While a 53’ long standard dry van is the most common truck you find, there are also refrigerated LTL trailers or “reefers” available that come in a few different sizes depending on the manufacturer. The “SpaceSaver” reefers are the roomiest, leaving ample space for pallets. Other reefers can have ducts running through them that cut down on the height. But reefers are generally heavier. This means they have lower capacity and you can only carry freight with lower volume, less weight, and/or freight that packs fewer pounds per cubic feet. For less than FTL requirements or Less Than Truckload (LTL) freight is often moved in slightly smaller trailers. These are just 28’ long pups. On the inside too, the height of these trailers is less than the expected 105” or 109” like that on the larger dry vans, measuring only about 99” or so. For this reason, you should be careful while picking a trailer matching it with the height of the freight it will tender to. In general, your shipment cannot exceed 45,000 lbs. unless the truck has a particularly light cab. Some truckers enforce a lower maximum of 43,500 lbs.! Also, the total weight of the skids – gross weight including the skid itself – must be evenly distributed over the axles and cannot exceed the truck’s maximum load. You can inquire about the truck’s maximum load at the time of booking. However, on reefers, weights cannot exceed 42,000 to 43,000 lbs. depending on the manufacturer of the particular trailer. A 53’ long van can generally take 26 standard 42”x48” skids if you “turn the skids”. A skillful shipper can fit 30 40”x48” skids! Van width can vary between 98” and 102” on the inside. Van height can vary between 100” to 114” on the inside. Van length is between 52’3” - 53’6” on the inside. How tall is a pallet and how much weight can a pallet hold, which we will find out. Ask the trucker for the exact inner measurements if you are trying to maximize space. To be completely sure, request the trucker to ACTUALLY MEASURE before driving to your dock. Now that we have established the overall expectations, here are a few more details that will help us complete the picture. It is important to know that skid and pallet mean the same thing, i.e. they are synonymous. You can find out how many pallets fit in a pickup truck to a trailer once you understand all about them. In the USA, pallets or skids can be custom-made and come in varying sizes. However, typically the standard shipping pallet sizes we encounter are: 42”x48” and 48”x48”. 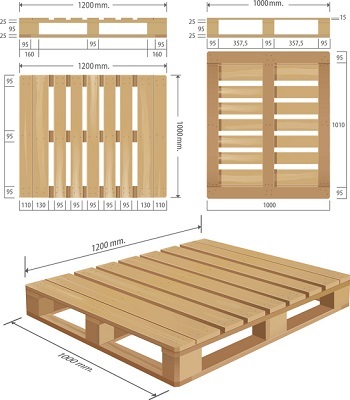 The 42”x42” and 40”x40” pallets are also common pallet sizes for certain industries. There are also the “Euro Pallets”. These are 48”x42” standard size pallet dimensions. This standard was set by the European Pallet Association or EPAL. Using them makes users eligible for the pallet swap system known as the EPP or European Pallet Pool. The US has a private company CHEP, that serves as a private exchange for reusing CHEP pallets, but no non-profit equivalent to the EPAL or EPP. “CHEP Pallets” are the painted blue skids that are re-used inside the “CHEP system” of pallet exchange. Various industries use CHEP pallets, most notably, the grocery business. Skids are also made from treated lumber (ideal for export markets), or even plastic. Usually, skids are 5.5” tall. Although, sizes can vary significantly with shippers custom-building skids for their purpose. Custom skids can be as low as 3.5” and as tall as 6”. 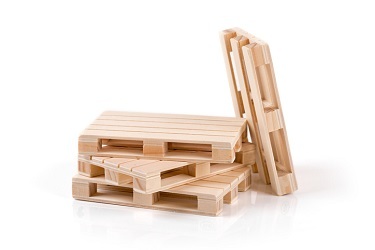 A standard pallet can weigh as little as 15 lbs. if it is new, dry and of a smaller size (40”x40”.) It is surprising how heavy is a pallet that is old- older pallets can grow to as heavy as 50 lbs. – perhaps due to swelling. A standard 48”x48” brand-new skid, that is well-built to handle up to 2500 lbs., can weigh about 40 lbs. The typical 42”x48” skids have built to withstand weights of up to 2500 lbs. But it is possible to reinforce skids and load 4500 lbs. on them. Although, of course, you must then be extra careful about managing the load distribution without breaching the DOT weight requirements. You can be sure that the DOT will penalize all problem loads at the inspection stations. Alternatively, you can also buy heavy duty skids, or custom-built skids, to distribute the weight of what you are shipping over a larger floor/skid space. Start by knowing the standard inner dimensions of a trailer before making packing and loading related decisions. The standard inner dimensions for a 53 foot trailer are: A 53’ trailer, has the following standard inner dimensions: 52’ inner length, 99” inner width, 110.25” inner height, 93” door-opening width, and 105” door-opening height. Totaling to about 4050 cubic feet. The (tare/empty) weight of a 53 foot trailer is approximately 15,000 lbs. For a reefer, the weight is about 15,500 lbs. While planning a specific load, we recommend requesting the exact weight from your carrier. You can fit about 30 nos 42”x48” pallets in a standard 53’ trailer, provided you turn them. Or, 26 nos 48”x48” skids. Typically, 24 skids of 48”x48” can fit into a 48’ trailer. You can also fit 26 skids that are 48”x42” if you turn them. Normally, just 20 skids of 48”x48” can fit into a 40’ container. To maximize the load, you can order a High Cube Container and stack the skids as high as possible. You can even consider handloading the boxes into the container to use-up space properly. Standard regular pallet size 48”x48” skids do not fit well into a 20’ container, so you must consider the smaller pallets of 48”x42”. Turn the pallets to fit up to 10 of them. Be mindful that you don’t exceed the maximum allowed limit (which is usually 44,000 lbs.) and that the trucker should move such a heavy weight on a TriAxel chassis. Check local and federal regulations to be extra sure. We urge you to check out the previous Freight Run blogs on the topic of loading your containers. In a non-permit situation, dry van trailers can take up to 45,000 lbs., sometimes a bit more as long as tractor and trailer together do not violate the set 80,000 lbs. the legal limit on USA roads. For a flatbed with a light tractor, trailers can take 50,000 lbs. Nonetheless, with a legal permit to carry extra weight, much heavier loads can be shipped. 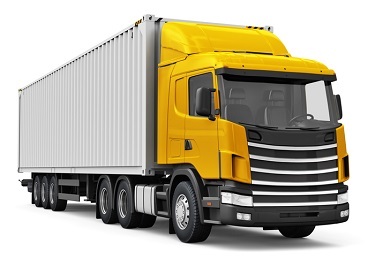 The term “18 wheeler” refers to the typical tractor-trailer setup. The tractor is the power unit in the front that pulls the trailer and together the two have at least 18 wheels. However, the question about an 18 wheeler’s weight limit is tricky at best. In short, without a special permit, the tractor and trailer together cannot weight more than 80,000 lbs. Typically, a loaded trailer can weigh around 45,000 lbs. maximum, leaving 35,000 lbs. for the tractor weight. As per the DOT’s regulations, weights must be distributed evenly over the trailer axels, such that no one axel is “overweight”. Weights must be estimated accurately, and FTL loads with gross-weight considerations should be booked up-front. The answer depends on what you are shipping. Since, we know that the maximum weight possible to load into a dry van (53 foot trailer weight limit) is in the range of 43,000 to 45,000 lbs., and into a “Reefer” is 43,500 lbs. If the product being shipped is lighter then you can maximize the height of the skids. The pallet size you pick should not just be suitable for the inner height of the truck, but also for the clearance of the door. This is because the forklift will need to move the skid at least an inch above the ground and into the truck. On LTL trailers, such as the 28’ pups, for instance, the inner height can vary from 107” to 110” while the height of the door stays at 104”. It is a good idea to be mindful of how high you stack your boxes on the skids. Some 53’ trailers have inner heights varying from 110” to 114” and dipping in certain spots. The height of the door on these trailers is 105”. Best to ask the Broker, 3PL or carrier the exact height measurements for the particular truck and checking if it could become an issue while loading your product. “Turning the skid” is a loading technique for making more efficient use of space and getting a greater number of skids into the truck. To “turn the skid” use a forklift to lift the pallet from the side (width-wise, or perpendicular to the skid stringers) and place it on the left side of the trailer. Place the skid next to it length-wise (parallel to the skid stringers) on the right, leaving it only 42” deep from the back of the truck. In the next row, follow the opposite pattern, which is, placing the skids from left to right, the first one going in length-wise and the next, width-wise. Thus, we use-up the space more efficiently. To use this technique, the skids must be constructed as “4-way skids” or “4-way pallets” in such a way that hauling pallets with a forklift is possible from every direction. Standard 40”x48” average size of a wooden pallet will allow loading of two pallets side by side in most of the trailers. Some overseas containers and refrigerated trailers may not be wide enough to do this with standard skids, requiring custom skids. Turning skids also offers us better protection from shifting during transport compared to straight loading. If you have a cooperative shipper/receiver, floor loading or hand packing a truck can lead to greater cost savings. Of course, the freight has to be light to handle this way. Still, there is a trade-off to make – while you save money by packing more, you may also need more time for loading and unloading the freight by hand.